Over the weekend Melbourne newspaper the Herald Sun ran a piece about an upcoming trial of tram priority by VicRoads, Public Transport Victoria and Yarra Trams. So what to make of it – an important move to make Melbourne’s tram service faster, or just another report to gather dust on the shelf? At present attempts at tram priority in Melbourne are half hearted – usually just a ‘head start’ green phase for trams before the right turn arrow kicks in. The ‘head start’ is implemented with a white ‘T’ aspect on the traffic signals, which applies only to trams. 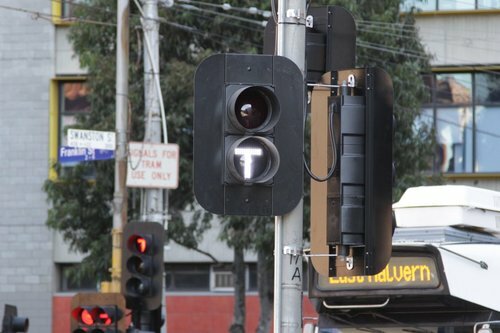 These ‘T’ lights can be found at many traffic lights around Melbourne, but their usefulness is dubious – some intersections use the ‘T’ lights to prevent trams from proceeding, and instead prioritise right turning cars! Trams would be given the green light to go through intersections before cars under a plan to improve traffic flow and safety on shared roads. VicRoads is also working with Public Transport Victoria and Yarra Trams to trial tram priority on three key routes. The trials will occur on Balaclava Rd between Normanby Rd and Nepean Highway; Dandenong Rd from Chapel St to Glenferrie Rd/Hawthorn Rd, and; Nicholson St between Blyth and Bourke streets. VicRoads acting road operations director Keith Weegberg said full-time and part-time tram lanes and platform stops were also being implemented. “Many tram routes, as well as key bus and cycling routes, have signal phases that allow them to travel before cars with the aim of improving traffic flow, ensuring the safety of all road users and giving public transport priority,” Mr Weegberg said. The reasoning for yet another trial being carried out isn’t given, which is strange given tram priority trials were carried out on Nicholson Street back in November 2011. The Yarra Trams media release at the time had this to say. One of the most effective ways to improve tram service reliability and network capacity is to improve tram signal priority. Currently, Melbourne’s trams spend more time stopped at traffic lights than most other tram networks in the world. On Tuesday 15, Wednesday 16, Thursday 17, Tuesday 22, Wednesday 23 and Thursday 24 November, we will be testing tram priority along Nicholson Street. What does this mean for passengers on Route 96? On these days, trams will not run to the timetable along the length of Route 96. Frequency of service will remain unchanged but tram arrival times may differ from the schedule displayed at the stops. Yarra Trams apologises for any increased waiting times associated with the trial which is a key step towards improving your tram service on Route 96. You can always find out when your tram is coming in real-time with tramTRACKER®. The November 2011 trial was also covered by Channel 9 news, who detailed how VicRoads controllers remotely operated traffic signals to give trams a clear run through intersections. Both the Yarra Trams media release and the Channel 9 report stated that the results of the trial would be released in the coming months, but I haven’t been able to find anything of the sort. So what will come out of these upcoming trials on Balaclava Road, Dandenong Road and Nicholson Street – faster trams on Melbourne’s streets, or just another report that never sees the light of day? 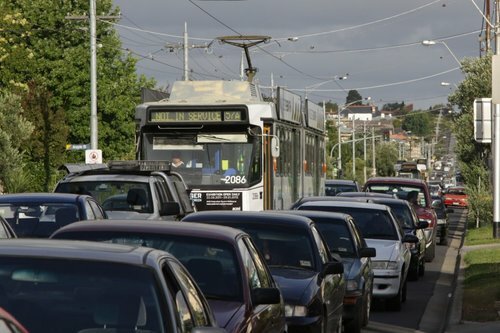 Melbourne’s trams are slowing to a crawl, stuck in traffic as car numbers on the state’s roads soar by 100,000 a year, according to a report written by Yarra Trams and handed to the Baillieu government days after it won office. With the number of people catching the tram growing by 50 per cent over the past decade, there has been a ”rapid deterioration of travel speed”, the report says – with trams now travelling 15 per cent slower than in 1999. Melbourne has the world’s longest tram network – 250 kilometres – but it is also one of the slowest, with an average speed of just 16km/h as trams spend more than 17 per cent of their journey time stopped at traffic lights. If Melbourne followed the boldest international examples, tram travel times would be slashed by up to 30 per cent, the the Tram Priority report says. I wonder how much slower Melbourne’s trams have become since 2011. We can thank all the traders associations and NIMBYs for having a tantrum every-time someone suggests that on-road parking is spatially inefficient. Until that is resolved, such attempts will be a valiant failure, probably. Sad. Traffic light priority has little to nothing to with car parking. Clearways are often about getting parked cars out of the way of moving cars. Cars zooming along next to the roads is not so nich for the pedestrians either. What we need is for trams to get the priority at traffic lights. One of the simplest ways to get trams through intersections faster would be to require right turning drivers to do hook turns at every intersection with trams and traffic lights, where the right turning volume is low enough. From what the Channel 9 report said about the 2011 trials, the level of priority given to trams was very aggressive, by giving them green lights the entire length of Nicholson Street. Once you take into account the fact that trams head in both directions, the delays to cross traffic would compound quite quickly, in the same way as a busy level crossing in peak hour – one tram clears the intersection, just as one in the opposite direction arrives. Presumably by only allowing trams to preempt the intersection at the ‘edge’ of the cycle would increase the amount of time for intersecting traffic. I saw the news article and agree that the 19 tram should terminate at the Brunswick rd interchange. The tram is so slow along Sydney rd, it’s almost quicker to walk. Removing the tram track along Sydney rd would also improve traffic flow. Why on earth would you truncate the very popular and highly used tram service at Brunswick Rd? The much more sensible option is to remove the on-street parking along this section of Sydney Rd. It’s simple – tram runs along a two lane road with congestion problems, then on-street parking goes to ensure that the tram gets a clear run free of traffic hindrance. It’s widely acknowledged by everyone (except retail shop owners) that on-street parking is a very wasteful use of road space, and the obsession with it is something that Melbourne is going to have to deal with sooner rather than later. Sure, strategies will need to be put in place to ensure that streets don’t become traffic sewers as the traffic will have the potential to be more free flowing, however, most of the relevant streets already have 40km/h speed limits in place which would prevent this. The solution to Sydney Rd is to ban the cars between Brunswick Rd and Bell St. It is a major shopping strip and would benefit from wider footpaths and not having cars dumping significant noise and air pollution and there would also be far fewer accidents. Tom, but the problem is it also a major north-south arterial road, with no other suitable roads nearby. Even my suggestion would meet with stiff opposition due to the fact that it culls on-street parking and reduces traffic down to one lane during clearway times. The inner north isn’t blessed with major north-south roads – and the ones that do exist are filled with trams: routes 55, 19 and 96. Pascoe Vale Road and St Georges Road would be the only exceptions, but they are a long way either side. It is true that the inner North is not rich in north-south arterials but it is rich in trams. There is also the Upfield line, which has plenty of capacity potential (with a few upgrades). Sydney Rd should still be open to bikes. Taking the cars out of Sydney would encourage mode shift to PT and cycling. Why is the tram at 1:23 on the wrong side of the road ? The fundamental problem with having green lights when the tram arrives at the intersection, is that many of the stops are just before the intersection, and it is difficult to know how long the tram will be stopped for people to get on and off. Also, you can’t just disrupt the whole traffic light cycle, for the trams. You can stop cars on cross streets within about 15 seconds, it’s harder to just interrupt a pedestrian phase while pedestrians are crossing. The footage is of a citybound tram at the corner of Nicholson Street and Alexandra Parade, but it has been mirrored – note the backwards text on the building to the left. As to why Channel 9 did it?